The Thresher is a nice looking diver with what I would call a black-tie sort of styling. 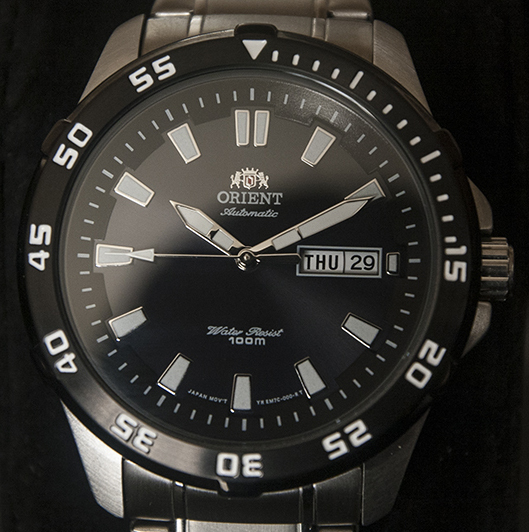 This is a watch that can easily pull off a more dressed up look, but unfortunately I found it is lacking some of the qualities I’ve come to expect in an Orient dive watch. 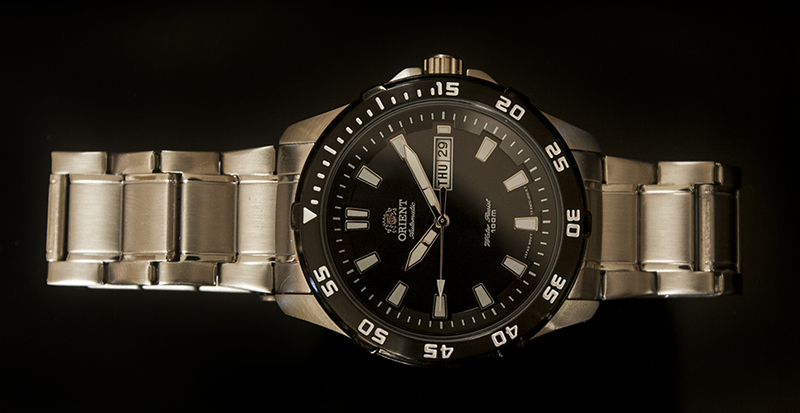 The crystal is completely flat without any beveling or chamfering and sits parallel with the top surface of the bezel. The crystal is made of your standard mineral hardened glass, and given the nature of this flat, edgeless design, should resist scratches and chips fairly well. The unidirectional bezel doesn’t feel quite as tight as other Orient divers I’ve handled (namely the Mako and Ray). That said, the grip on the bezel is good with six lugs protruding at 10-minute intervals. The markings on the bezel are that of your standard diver with single minute marker until the 15-minute point, and 5 minute numerals thereafter. There are 60 clicks in a full rotation. The blackness of the bezel itself looks nice, though I suspect it could be prone to scratching. The dial is nice looking with a very subtle sunray pattern over a black satin gloss. The effect is more dress-like than diver-like, which I suspect was the idea for this watch overall. The indices are executed in raised batons which help to reinforce the “classy” look of this watch. The date window was slightly disappointing however with what appears to be slightly different colors on the day and date wheels. This is only noticeable upon close inspection, but was still a disappointment none the less. 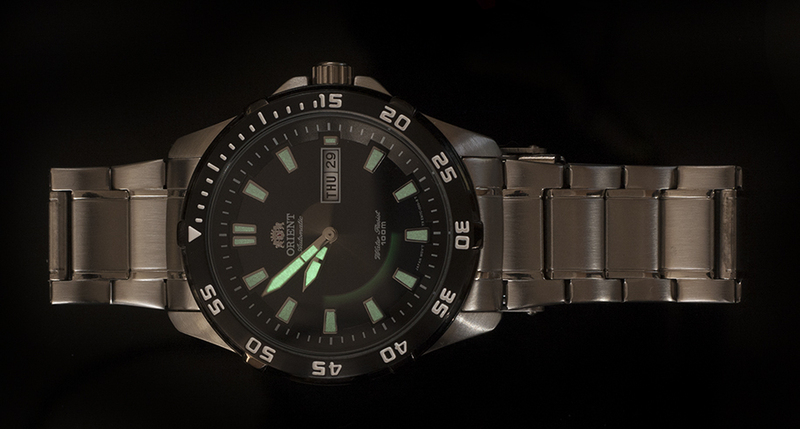 The lume on this model is significantly less bright than my Orient Ray. The indices and hands look good during the day, but nighttime is a disappointment with this watch. 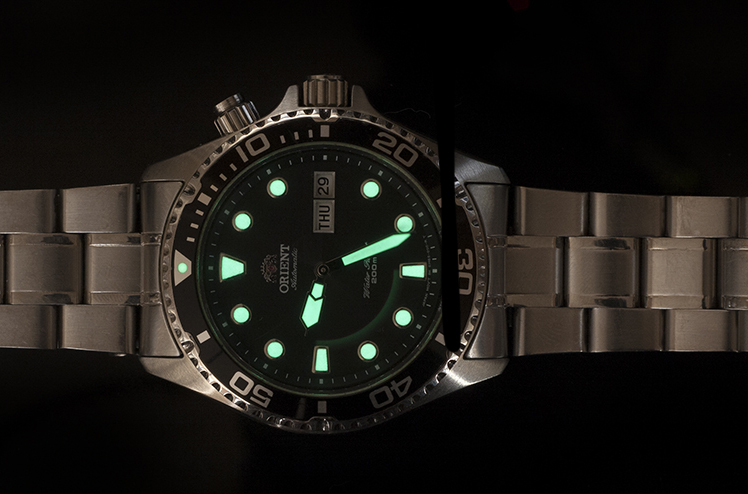 Take a look at this comparison to the Ray’s lume taken under identical exposure settings. Bummer. The crown is your standard pull out crown. I would have liked to see a screw down crown seeing as this is technically marketed as a dive watch. The quickset for the day is a recessed pusher located at the 2 o’clock position. This is a simple means of changing the day, though I wouldn’t think this mechanism is particularly water tight. The bracelet is your traditional oyster bracelet style. Unfortunately it is made from folded links that feel hollow and tinny. The watch feels slightly unbalanced with a lightweight bracelet and fairly heavy watch head. With that said, it does employ a nice closing mechanism with double pushers and a safety clasp. 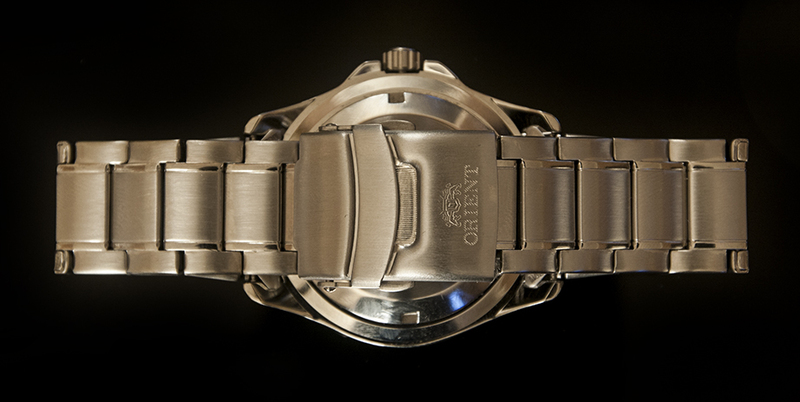 The movement under the hood is Orient’s caliber 46943, which is a sturdy, reliable movement. The rotor on this particular model seems a little bit loud, but this may just be due to the thinner case not muffling the noise. The packaging was the nicest I’ve seen from Orient to date. The box is a folding design that opens up like an oyster to revel the watch. The top opens and the front wall folds down leading to a very dramatic first impression. This was a nice touch, but really, nobody buys a watch for the box. I really wanted to like the Thresher, but as I looked at it the bad slowly started to outweigh the good. This is an attractive diver that is more suited to life under a sleeved shirt than under the water. There isn’t anything wrong with that really, and if you really like the look, then by all means go ahead and get it, but seeing that this watch is well within the same price point of other watches in Orient’s catalog that have higher quality components and better finishes I would pass on the Thresher and go for something else. If you do pick it up my suggestion would be: replace the bracelet and keep it away from the ocean. The Thresher (FEM7C00) is available in Black on Black, Silver on Black, Silver on Blue, and Silver on White. 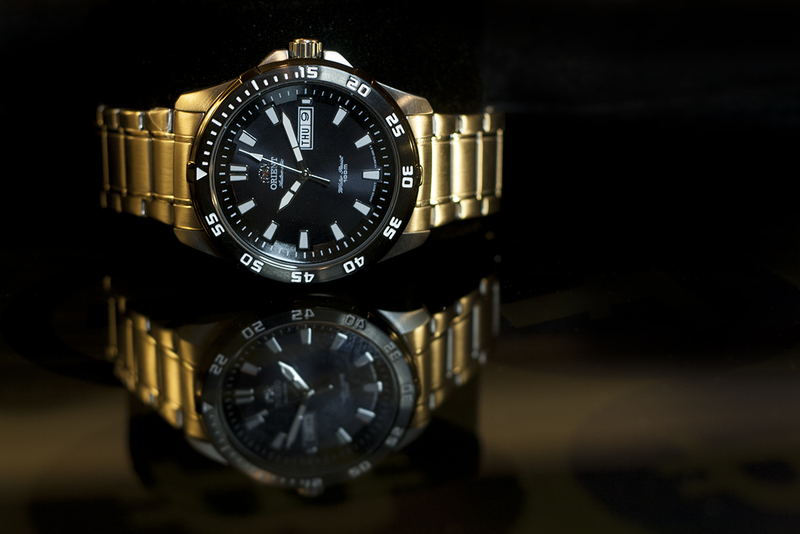 I hope you found this Orient Thresher review helpful! Did I leave something out? Have something to add? Let me know in the comments.